My story began late August or early September 2016. The school my son goes to called us and said he was crying and when asked why he told them that "The Mystery Person" told him to hurt his brother. He said he wasn't going to listen to him though. At the time I didn't think much of it because school can be stressful for a 5 year old that has just started kindergarten. My wife and I shrugged it off as his imagination. He does play pretend with normal things like Ninja Turtles and stuff so at the time this didn't seem too crazy. A few weeks later I picked him up from school and we went to Walgreens, on our way he mentioned that the mystery person was following us. We got into the store and he said "look daddy he is crawling on the walls! He is crawling on the ceiling!" I looked at him while he was saying this and his eyes were definitely tracking something that I could not see. I asked him what his name was, he told me "He can't tell me his name". I asked well why not and he said "Because he has no face, he has no mouth, no eyes, no nose or ears." I thought this was getting a bit strange but being a very rational person I still assumed his imagination was just running wild. He would still talk about having seen it at school over the next month, I didn't get many details about it until probably early November when we were downstairs playing. He said he had seen the mystery person at school, I asked him where does the mystery person come from? He told me "He comes from underground and is covered in fire". At this point I began to suspect maybe there is a bit more to this thing than just imagination. There is nothing he watches or has ever seen that remotely resembles anything like he has described, he watches Spongebob and Dora and that's about it. My older son who is 7 said the mystery person is not real. This made my 5 year old upset, he reaffirmed to him that he was indeed real. Most of the time nothing happens regarding this around our house, I would say 99% of the time he is a completely normal 5 year old, he has friends, is not super quiet but not very talkative either. A few weeks later probably late November is when it started to get very strange. I was cooking dinner and I hear him from his room yell "Daddy come look! Come look!" I put dinner on hold for a moment and went to his room, he was jumping on his bed laughing and looking out the window. He points to our neighbors nativity scene they had set up earlier that day across the street and says "Look daddy! The mystery person, he can't get past baby jesus!" Now at this point I am pretty sure there is a lot more to this thing than imagination at work. This kid has been to a church maybe 5 times in his life, although he did go to preschool at a church which is where he learned about baby Jesus. He said baby jesus was making the mystery person angry so he left. About 3 weeks later it got worse, he was outside playing during recess and just started crying, the teacher asked him what was wrong and he said "the mystery person told me to get the sharpest metal and kill my friends". At this point the school needed to have a meeting with us to address the issue. The next day my wife went to meet with them and she finds out that the counselor had asked what him what it looks like, he told her his skin was black and he wears a hood he was very precise about it, going as far to mention that it is not like a black person but BLACK. He had also mentioned that it lives underground underneath his classroom and that is was going to leave on the first day of winter and return in the spring. I thought to myself finally he mentions something that does not align with demon, a few days later I decided to do some research on demons and come to find out that this is actually a fairly common thing, I read about a demon and there was a line "this demon like many others will leave on the first day of winter and return in the spring". We still have no idea how he knew when the first day of winter was, he wasn't learning that in kindergarten and we didn't tell him but on December 21st he knew. The next day I thought screw this thing, so I went to the christian bookstore and got him his own little nativity scene and a cross necklace for good measure. I set out the nativity scene in our living room and told him I got him a cool necklace if he wants to wear it. He didn't want to wear it at the time so I hung it up on the fridge. December 23rd comes and he is looking out the window in our kitchen and says "the mystery person is gone now but he will be back" he pauses and points to the cross necklace I had hung on the fridge and says "Daddy the mystery person doesn't like that". I asked if he wanted to wear it and he said "Yea" very enthusiastically. He put on the necklace and was dancing to a disney song in the living room saying "Oh the mystery person is so mad about this, he is very angry." He stops and points right at me and says "Daddy, the mystery person says I know what you are trying to do." I said that I thought the mystery person was gone now, my son told me "he is but I can still hear him". This is the point at which I think to myself screw this thing I am getting a priest in here. I found a priest that would come do a house blessing, he asked me all sorts of questions about what books I read to him, shows he watches, games he plays, all that sort of thing. As far as I knew there were no cursed objects in the house or anything like that and I wasn't showing him any horror movies or crazy stuff so he comes over about a week later. As soon as the priest steps foot in our house my son had a message for him, he said "The mystery person wants to knock you out." The priest did the blessing everything was normal and went well I thought. Since then he hasn't been able to hear this thing inside our house. I am somewhat worried because he is back in school now and tells his teacher the mystery person is underneath the classroom sleeping. There are a few other details we have received about it. It has glowing red eyes at night, has a shield of fire, he said something one time about its body having "like ornaments" around it, and that it tries to be sneaky. He sees a psychiatrist that has ruled out the possibility of him being crazy. The school counselor says something like this is way outside the pretend range for a 5 year old and she also has seen him track it with his eyes. I have no idea what to do, he has asked us to make him go away, he learned himself that if he shows it jesus it gets mad and runs away, we never told him to do that at all. I am 99% sure this thing is real I just have no idea how to explain to a 5 year old what it is he is seeing. On Christmas eve he was in the car and started laughing, he told us God gave him a present that means God will protect him and that he belongs to God now. I asked to see it and at the time I had no idea what it was, it looked like a tiny medal with a cross on it. After doing a search we found out it is a St. Benedict medal. St. Benedict I guess is the protector of school children and protection from demons. We started taking him to church and he sees it outside of churches, I asked him what it is doing and he said "he waits to attack someone when they leave here". For now it's been quiet, nothing new, but if it comes back any advice would be appreciated. The following comments are submitted by users of this site and are not official positions by yourghoststories.com. Please read our guidelines and the previous posts before posting. The author, Mabeldog, has the following expectation about your feedback: I will participate in the discussion and I need help with what I have experienced. long time since update because nothing has really happened. The first day of spring came and he said "The mystery person is moving quickly now." He had his meeting with the counselor the next day, the counselor asked him about it and from what I understand he told her that "God says the mystery person isn't allowed to bother me anymore and God showed me how to get rid of the mystery people." He has been much happier, just a normal kid. He told me a few weeks after his counselors meeting that to get rid of the mystery people he tells them "God says you're not supposed to be here" and then they go back into the ground. A bit strange but I am not worried about this anymore he hasn't even mentioned seeing one for probably 6 months now. He still sees a counselor and all is good here. Your story is intriguing to me. I believe this as true. But it makes me question as to why so many things... Such as where this thing originated from the school or the house and why would it be at Walgreens lol... But seriously, I believe everything you wrote. It's been a while since this was written. Are there any updates to this story? I wonder about the house. How long have you lived there? Any weird histories of the house or school? Did you find out where the St Benedict's medal came from? I have not written out my story yet, but I wanted to mention that it is a common practice for Catholics to bury St. Benedict's medals in the 4 corners of the house in the Earth. Is it possible that your son dug it up outside? Sometimes they do this to protect a house they feel may be cursed or some do it out of habit to prevent demons and such. Now, some do this inside their homes as well. Mentioning this because in our house which I felt was haunted I put medals inside rooms near doorways but often tucked them under things like under the rugs etc. I think I may have left a few when we moved that I placed inside. So I'm suggesting this is where one might have just appeared with your son. He may have found one that a previous person hid, or even in his school maybe someone hid one so these are very probable reasons where a St Benedict's medal could have appeared from. Do any other kids at school see this? The dates seem significant as well but scary that the thing can still get inside your thoughts during this time period. Kikigirl - I'm simply roaming around on YGS this morning. Have a free day, husband doing other things, me, left to my own devices, what joy 😆. I have noted from your comments and stories that you are from Pretoria, as am I.
I would like to ask you a question as it has me slightly confused. In one of your comments on this story you asked Rook whether he has an "ulterior shielding method". Did you in fact mean "alternative" and not "ulterior"? It changes the whole meaning of your question! I am not nit-picking, would simply like to know what you meant. I registered here due to the finding out about your story. The St. Benedict medal is indeed the way to go: it is a medal with an exorcism prayer on it against the Adversary, and is often used (inlaid in crucifixes) for exorcisms. The traditional blessing contains an exorcism prayer being done over the medal (not sure about the "updated modern version").That said, a sacramental should not be handled in a superstitious manner: it does not have power of its own. Instead, it functions ex opere operantis: it depends on the faith of the person making use of it. I would suggest getting more St. Benedict medals and crucifixes for your home along with traditionally blessed holy water and exorcised salt (can also be used for cooking). Also, as a parent, you have the natural right of authority to perform prayers of deliverance over your child. Update- I am still a dude. Normally I would think the same about the picture, just a blur or artifact of some sort, I still think there is a high chance that is all it is. It was just a bit strange under our current situation. Due to my children being involved I am not interested in any sort of documentary thing. No news as far as the mystery person goes, he mentions it every now and then but it's mostly about when it's coming back. As far as the counseling thing goes it is fairly interesting because they know he is not crazy, and this doesn't really fit the profile of an imaginary friend either so no answers there yet. Again I can't remember where I found that thing about some demons being more active during the spring and leaving on the winter solstice, this could be an example of looking for the information and finding it. I could probably find a connection between these things and having a cold or a flat tire. Tweed I had to reword a bunch of my stuff because it originally included some cussing:) aside from adding a d-ck pic I can't help you. Tweed - I can personally answer the eczema question. Yes they do. My daughter and oldest stepdaughter both have eczema. It doesn't prevent them from wearing tight clothing. This looks like a photoshop smudge tool has gone over a big log. A bit like my initial feeling toward this post. Also do kids with eczema generally wear tight fitted clothing? The wording in this narrative feels feminine to me, I politely said this initially. After revisiting this thread, with the picture added, and the Kiki weird post which has it seem MabelDog is her, I'm finding a nice shady spot on this here fence. Note: some new photos provided by the author have been published. Greetings, Mabeldog, and welcome to YGS. I, like Lady-glow and RC, would love to know the source for your supernatural information. The paranormal is --by definition-- beyond ordinary life. Why would beings not confined to mortality begin following either the lunar year or the Gregorian calendar? Who would write such assertions without some providing data, however apocryphal, for support? It isn't as simple as a bird enthusiast raising homing pigeons and documenting the time it takes each bird to return home. I'd like to know more about your sources of information before I make further commentary upon your narrative. rookdygin! Thanks for sharing the shielding method, although I am hesitant to try it. Maybe, one day. I absolutely only have 1 account! I have no reason to pose around as someone else. More recently, because I didn't give out accurate info in an article I posted, I received some negative feedback. However, I have had a really good experience on this website and with its Users. I even feel like I'm building some friendships here and there. So, I don't have any reason to use another account to post my stories. Lol it's weird how you picked up that link. It's just... Unusual. Shielding/Cleansing Methods vary as much as those who use them. At the very basic level a 'shield' is something the 'user' can visualize surrounding them (Fire and White light are common) not letting unwanted energies/spirits/emotions to 'touch' the individual. Some people pray to (insert God (s)) of choice, to provide this shield, others 'ask' their ancestors and some people 'craft' it from their own will. rookdygin, the only shielding cleansing / method on your Profile page is the 3-day-at-work cleansing method. Is there an ulterior shielding method that you know / recommend? rookdygin, you have provided some really useful and interesting information. I actually had a Brother who passed as an infant. My Mother, being Catholic, was distraught at the idea of his soul going to hell because he had not been baptized. I was born shortly after his passing, a miracle baby, if you will, born in a time of great loss and sadness bringing happiness and joy to everyone. Although I am a Christian, I just do not and can not believe that God would allow what you said or worse. And, the beast that I saw did not screech, as far as I saw or heard. Still, it is new information and great help. Thank-you for posting your comment. You may want your son to Shield,, 0f sorts, heck use the method I have posted in my Profile. Or teach him a prayer... There are many ways to help him. A drekavac (The yeller, drek, drekalo) is a creature of the night and graveyard, originating from south Slavic mythology. It is said to come about from the soul of a dead unbaptised child. Some believe it can only be killed or laid to rest if its soul finds peace; baptism being an accepted method to achieve this. Many forms have been attributed to the drekavac, it may be possible that it switches between these forms. Those of a bird, dog, fox or a slender bodied baby with an out of proportion head have all been given. A reason for this may be the belief that when seen as a baby the drekavac predicts death but when seen as an animal it predicts cattle disease. Though another explanation for the variation may be different variant types for different regions. Features that remain constant are its height being above 1 metre and its horrifying scream. Its screaming, mainly heard coming from the graveyard, is said to be a cry for baptism. Though in some places, should it scream outside a house all night, one lodger from the house will die. Many explain that the drekavac has long fur and every time it steps on that fur it will let out a scream of pain. Other vile acts, besides its terrible scream, include, falling on a person, or allowing its shadow to cross a person's. In either case the victim will soon fall ill and die. Yes, there is some pretty weird stuff on Teenage Mutant Ninja Turtles, but I hope you pay attention to what your child watches, and use such to help teach your children good morals. I'm wondering, since your mom has/had a similar medallion, did she give it to your son and say it is from God? [at] tweed I am very much a dude:) and yes my 5 year old who just turned 6 is way ahead of the curve for speech at his age, he can read better than most 2nd graders too. My 7 year old on the other hand is extremely average as far as that stuff goes. I don't like how this thing is getting more defined with the passage of time. What prayers does your son know? Is he the only who sees this thing? Is this the only thing that he can see? Have there been strange goings on in your house around religious icons? I agree with RC about the medal. Saintly or not, I'd feel more comfortable knowing that it came from somebody of flesh and blood who just happened to be the right person at the right time (that's how He usually works). What I find even more uncomfortable is... This sounds like an oppression without the invitation. If your son is a baptized Christian, there has to be an invitation before anything like this can start happening. Have you also gone to a demonologist? I tried finding the page I had found about the connection to the winter solstice and still haven't found it. Closest thing I found was about a demon named drekavac which is more active in the spring time. I will keep looking though, as far as the St Benedict medal we found that my mom had one so he possibly got it there but I have no idea why he would assume god put it in his pocket. One detail I left out but may be important is that my son has eczema really bad, we have taken him to a ton of doctors and allergists and they can't find anything wrong with him. He has had it all his life pretty much and I just found out that there is a link between that and demons. I am not sure if it is total crap or not though, seems people want to blame demons for everything nowadays so I don't know but since the mystery person left his eczema has cleared up almost entirely. 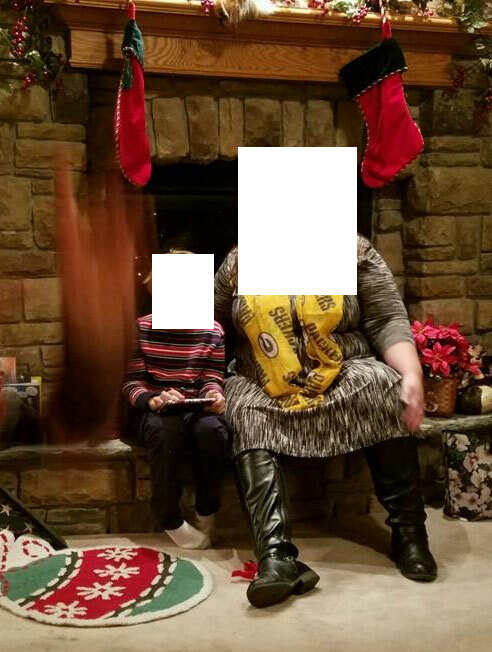 Yesterday my mom sent me a picture she took while my family was at her house and there was an extremely strange anomaly in the picture. I have seen the pictures of "ghosts" before which in my opinion prove next to nothing but this picture is VERY strange, I will see if I can upload it here soon. I don't mean this in an offensive way, your wording is very feminine. It's as if a woman typed this. Also the son's dialogue feels off, as if baiting, leading, beyond his years and/or reasoning. Wow, people! Don't go too far? Nerbraska; did you say your son knows Ninja Turtles? I know of that show will have "evil looking" villains, the "Foot Ninjas", Ninja Turtles' enemies. And in my image (as a child I watched that show too) the voice of Shredder was quite "mystery person" like, so there is a possibility as it being an imagination. Talking about people or kids being possessed or hearing voices, as you already half knew that there are more chances that it is a result of a stress. One thing that people will always mistakenly do is that they will let fear overwhelm the patron, your case your child. Good thing that I saw reading on is that your child looks like he knows what is going on and I am so glad that you did try your very best to be calm. But really just remember not to fear the facts, do a cleansing of any kind and say any kinds of prayers if necessary. My grandmother will always say 'you will realize that it is just fear after all'. I totally agree and will do as she had advised me. It sounds like you are doing all the right things, Mabeldog. I'm out of my league here. But having gone to Catholic schools in the days of nuns, I can tell you that your story makes me think those nuns were on to something when they told us about demons. I think it's awesome what you've done with your younger son already. It's everything that you can. I believe that he was given a gift from God. The St Benedict. I mean, it's God, there's nothing stopping IT manifesting something of protection to an incredibly gifted kid. Well done on knowing what to do when. The really weird thing about demons is that they have the ability to appear as angels of light. (Not that hard, really, as so many people are spiritually blind.) Everything in this narrative sets off alarms for me. I'm not even 100% sure the 'gift' is from God. In spite of human frailties, it's best, imo, to get these things from flesh and blood human beings and have them properly blessed by a spiritual authority, who will also be a human being. And like Lady-Glow, I'm curious for your source of information about this particular demon. To be honest, I can't offer any advice or help on your experience, though I have some questions about it and would appreciate your input. "...He had also mentioned that it lives underground underneath his classroom and that is was going to leave on the first day of winter and return in the spring. I thought to myself finally he mentions something that does not align with demon, a few days later I decided to do some research on demons and come to find out that this is actually a fairly common thing, I read about a demon and there was a line "this demon like many others will leave on the first day of winter and return in the spring". Could you please provide the reference/s or links to this information? Do you mean the St. Benedict medal was given to your son directly by God? Like in it "appeared" out of nowhere? If so, I'd think that he is safe and already under the best protection. I'm looking forward to read the advice from the more knowledgeable members of the site. © The ghost story Black Faceless Mystery is copyrighted to Mabeldog. Edited by yourghoststories.com.